Regular readers of Hoe and Shovel may recall that I'm a newbie to vegetable gardening. Landscape gardening is my passion and seems second nature after cultivating the same home garden for over 25 years. Even with all those years, it was a huge challenge to take the plunge into vegetable gardening. Mostly due to the "unknowns". Once I decided this was to be the year, no matter my own hesitations, it was settled. My first ever, small, raised bed garden was planted out in Spring '08. There were several posts written regarding my challenges and victories during that growing season. When all was said and done and the last of the veggies were harvested this summer, some of the intimidation I had had about tackling this long time dream of growing my own veggies certainly seemed silly. Isn't that usually the way that goes? SO! After giving the soil an 8 week Summer rest, it was turned a few times within a few weeks prior to my anticipated planting date. I made amendments with Dried Blood and Bone Meal and sowed seeds on September 15. Earlier in August I sowed my tomato seeds in smaller pots. There seems to be a general consenus in the vegetable growing world of the ease of growing radishes. For some reason I didn't plant them until the Fall. 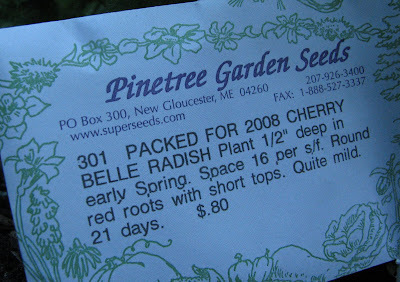 You'll notice the package notation to plant in early Spring. I'm assuming that is because this company is in Maine and the fact that a Florida gardener might plant them in the Fall is not considered. No matter. I'm so brave now (ha) I'm taking risks. Radish plants before harvest this weekend. But, really, how much of a risk is it to plant out some seeds? Either they make it or they don't. What do you have to lose? Seeds are cheap too... you know, compared to buying plants. To newbie gardeners: I highly recommend including radishes with your first plantings. The first sign of life pops out of the ground in about 48 hours and from that moment on they seem to grow like a weed. Those of you who have been doing this a while probably would even recommend trying to grow them in containers. I can't think of why they wouldn't do well in this environment. Besides being fast and easy to grow, their very pretty in color and tasty, too. I plan to sow more seeds of radishes and lettuce tomorrow. Overall the current fall veggie garden has had few problems. Grasshoppers have found it quickly this time around. They are a menace to the greenery but I track them down with determination. 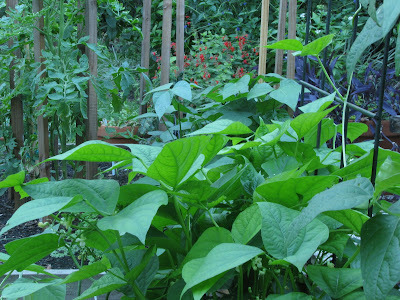 So far there are lots of flowers on the green beans, pole beans, lima beans and tomatoes but no fruit forming yet. I anticipate vegetables for Thanksgiving, though, which was my main inspiration for giving the fall garden a shot. I have to say everything about it IS a lot easier compared to the Spring garden. Easier in the sense that I'm not obsessing over trying to figure everything out. It seems more like it is part of the flow of the entire gardening experience rather than a separate experience all together. That's it for the veggie garden update. There is surely more to come. Take some risks. Plant some seeds and see what happens. "To get the best results you must talk to your vegetables." Congratulations on the radishes! I bet those are gracing all your salads right about now! Great results. Fall is also my best time for vegetable planting. Don't forget to cook the radish tops as greens! mjm: Thanks. Yes, truly mild and tasty in my salads yesterday and today. nicole: I'm not sure yet if I'll consider this my best time. It does seem as if the milder weather is easier on the plants. But the shorter days and now cooler nights might make growth a little slower. It will be interesting to compare. 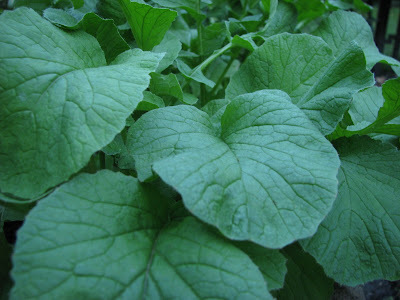 About the radish greens... are you saying to cook them like collard greens or like spinach greens? I must say I hadn't thought about it before. You've come along way since the spring. Yes, there is nothing to lose by sowing a few seeds and a lot to gain. Those radishes look like they will taste great. Carol: And many thanks to you and your encouragement, I put those first seeds in the ground last spring. One would have thought it was much more difficult than it really is. The conditions here are challenging but that is half the fun. Figuring out ways to solve problems in the garden is part of the joy. Thank YOU! They certainly look like healthy plant. Things just seem to thrive in your tropical environment! nicole: Thank you so much! That sounds really good... I'll try it. Looks like this will be just the week for it too with our temps dipping a little. Robin: Well, learning what thrives is crucial. There are so many plants that just don't like our heat and humidity- they are best avoided rather than wishing it were any different than reality. thanks. I really envy those of you who can garden spring AND fall. Your radish look wonderful. You are a superb gardener and most people don't pick up on vegetable gardening as quickly as you did. We all have things that don't do well for us depending on where we live. I knew you would be successful because you care and can't stand for anything to get the best of you. Now this will make you feel lots better...I lost $75 in seeds. Yep, I directly sowed them in the soil and then the chipmunks had a feast. The only thing I had left--where the Envy and Peppermint Zinnias. I don't have a blog these days. My new blog froze up on me...yes, I know, how many have I killed now..that would be no.6. I will be around to see you often. Meems, you did really well on your first foray into vegetable gardening. You make me want to try even harder next year and expand my plantings. If you haven't tried the first, early leaves of radishes on sandwiches, they add a peppery flavor that is wonderful - I planted radishes just for the leaves! Congrats on your fall veggie garden Meems! I am a newby to veggie gardening too. I've grown a few things in pots in the past but this next spring I plan on having a dedicated veggie bed. :) Thanks for sharing your experiences. nancy: We do live worlds apart. I imagine our weather right now to be much like your summers. I envy that in the midst of summer. Anna: Those silly chipmunks can be a menace. There are many elements against the gardener... but I would say in the end there is much more going "for us". We do have to learn both sides don't we? Kim: Now that you mention it, I thought I read that about radish leaves somewhere but must have forgotten... I'll try it on the next batch. I'm planting more seed today. Thanks for the tip. Cameron: I don't think a vegetable garden would fit your deer and rabbit resistant perennial garden. Those hindrances would have to be dealt with in a whole different way. Thanks, Raquel, I have big plans to expand my spring garden. I'm still working on getting hubby to agree. He is hesitant to agree to add any more work to my "gardening plate". I've got a couple of months before I have to get busy on expansion. Hi Dee: It's interesting you started with vegetables. Either way it does seem a natural progression doesn't it? I don't know about Black Seed Simpson... thank you... will check into it. For our area I recommend Burpee: Lettuce: Heatwave Blend. I grew it in the spring and loved it. It is going to like the fall weather even better I think. I have recently adopted the philosophy of just putting a plant in the ground, it can be moved if necessary! It seems there is a similar corollary with seeds...just plant them...they are seeds and can be easily replaced! Just this morning my husband and I were discussing our friends new giant vegetable garden, when I was reminded of your early beginnings. You have created a beautiful and very successful garden! I agree. Best thing is to jump in and start planting, seeds, plants, whatever you like;) If you are afraid to buy perennials which are a bit expensive, start with pass alongs. Plants that people give away are usually perfect for the area and can hardly be killed. There are really only a handful of constants that apply to all things growing. Meems, I am so glad you are conversing with your veggies and they are responding with such a good harvest. i really enjoyed the radishes we had this summer and dave eats them whole. he is on a holistic diet and has lost 10 pds in two weeks. he is eating tons of radishes. i love the look of blue lake beans and i do remember how they tasted at the dinner we had during summer. When I was much younger I convinced myself I didn't have time or patience to move anything around. If it didn't get put in the right place initially, it was just too bad. I threw away a lot of plants... I know... gasp! Even though I still try to avoid making more work than necessary I really enjoy improving on the design of the garden and will happily move things around if needed. Yes, seeds are even easier than plants in that sense. Beckie: that's kind of funny... my veggie garden is MUCH smaller than my landscape garden. Hmmmm... radishes and butter... sounds interesting. I actually had some beans on the plants today. It took me totally by surprise. There was only 5 of them but like I said in my post I didn't think I had any beans yet ---only flowers. I just went ahead and ate them right there. How interesting, Meems, that you are getting your first harvest from your fall vegetable garden just as I am ready to put mine to "bed" for the winter:) Ironic, too, that I'm a relative "newbie" to flower gardening, but have raised vegetables off and on for many years. I used to plant radishes in the same row as carrots,something my Mother taught me--by the time the carrots begin to grow, the radishes are ready to harvest. 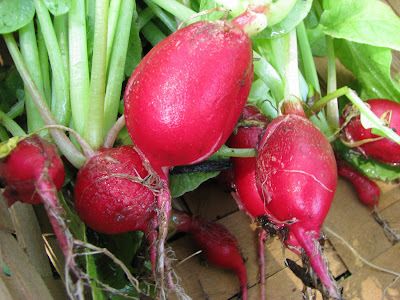 Your radishes look great, and I envy the fact you will have fresh homegrown vegetables for Thanksgiving! Rose: That IS interesting... it's also how Dee got started. Don't you like being able to do both now?I actually planted my radishes next to (in front of)the carrots thinking I would pull up the radishes just about the time the carrots were getting tall and bushy. Because I don't have a lot of space, I've got things pretty crowded in. Yore Radishes is ravishin' pretty thangs, Meems! Vegetable growin' is very satisfyin'. We's havin' a cold snap up heah a few miles noth east of yore spot--an I'se worriet that mah tomatoes will shiver.